A concise political essay on how Ronald Reagan cemented such a huge victory in 1984, while still not being exactly able to count on a popular mandate. Reeves, who for years has been writing some of the most intelligent political journalism around, has taken a breather from his two recent travel commentaries, Passage to Peshawar and American Journey, to present a compact Making of the President: 1984. Reeves insists that the Democrats' problem is one of being in a political fog. He finds the perfect symbol of this in Mondale's 1981 announcement that he was taking a year off to read and think--a telling comment from someone who had already spent 30 years in public life. 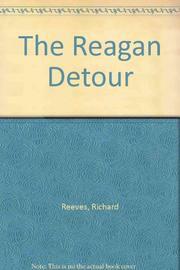 This is the problem from which the Democrats will have to extract themselves if they are to ensure that Reagan's detour remains just that. The 1984 election presented two candidates both talking about "family"--but Reeves delineates the two versions: Mondale was speaking of the "family of man," not much different from the old liberal ideals of the government stepping in to take care of everybody: when Reagan said "family," Reeves writes, "he meant Mom and Dad and the kids--you and yours, me and mine." Apparently, the electorate at the moment prefers a "fortress family" outlook. So Reagan got his consensus. But, Reeves notes, "Today's consensus becomes tomorrow's contention." To him, the matters for contention for the rest of the decade will revolve around four main questions: l) Who pays? 2) Should we prepare for a world war? 3) Can we impose a Pax Americana? and 4) Are we really our brothers' keepers? Reeves finds the coming debate on these questions to be a matter of great excitement, and in laying them out he makes his excitement infectious. Surely to be talked-about as America gears up for the next presidential election cycle.